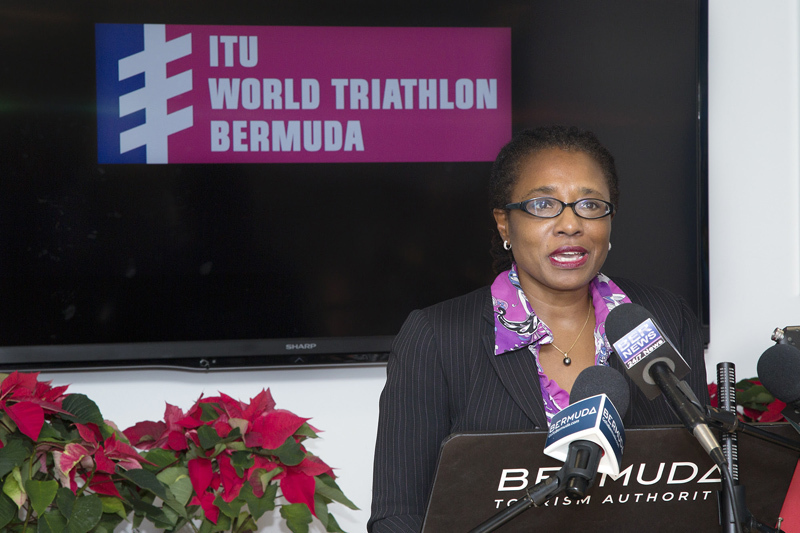 Pat Phillip-Fairn, chief product and experiences development officer at the Bermuda Tourism Authority, will leave her role with the organisation on April 30, 2019, following this year’s World Triathlon Bermuda. “Ms Phillip-Fairn has served in the position for the past five years, starting shortly after the formation of the Bermuda Tourism Authority in 2014. She has cited the need to tend to family matters as the reason for her departure,” the BTA said. “While I’m sad to have a valued leader in our organisation depart, pride is what I feel most when I look back at the enormous accomplishments of Pat and her team over the past five years,” said Chief Executive Kevin Dallas. “Under Pat’s leadership, her division has shepherded a new wave of tourism product and experiences that cater to younger visitors who are more adventurous and experiential. The BTA added, “In culinary, performing arts and heritage, Ms Phillip-Fairn and her team have worked tirelessly to infuse a deeper sense of culture into the experience of Bermuda’s visitors. “The Bermuda Heroes Weekend Carnival, Bermuda Festival of Performing Arts, Bermuda Street Food Festival and Peppercorn Ceremony are examples of new or enhanced cultural experiences where Ms Phillip-Fairn has had a direct positive impact. “Sports tourism is another area where Ms Phillip-Fairn’s work will have legacy. In Nautical Tourism she has worked to grow visitors and economic impact from existing races like the Newport Bermuda Race and Marion to Bermuda Race, but has also broadened the calendar by introducing the Antigua Bermuda Race, which now runs annually. “She also had a hand in the formation of the International Pilot Gig Regatta, which started during her tenure. Meantime, in the wake of the America’s Cup, Ms Phillip-Fairn led the development of the Bermuda Tourism Authority’s superyacht strategy. “Beyond nautical tourism, Ms Phillip-Fairn partnered with the National Sports Centre to spark winter training camps for visiting teams and coordinated Bermuda’s successful bid to host the ITU World Triathlon. Bermuda Economic Development Corporation Executive Director Erica Smith said: “Pat and I have worked closely together over the last few years in growing tourism entrepreneurship in Bermuda. She has been a fierce advocate for highlighting and developing Bermuda’s entrepreneurial talent and offerings in the tourism sector, while growing the product and experiences remit by leaps and bounds. “I feel like I’m leaving a family at work,” said Ms Phillip-Fairn about her pending departure. “The only way to successfully complete the difficult, important work in tourism is to do it with a group of people who are passionate, committed and working cohesively. Thanks for your immense contributions to our tourism product. Thank you for your vigilance and massive contribution to revitalizing our tourism industry despite loud mouths like Zane Desilva while he was in opposition!! Pat Phillip-Fairn – thank you for loving our Island home! You are a class act. Bermuda was lucky to have your expertise and experience. Good luck with your feature endeavors and thank you for all you have done in reviving our product. Thank you Pat, all the best with your future endeavors!